Imus was fired today by CBS, reports David Bauder of The Houston Chronicle. But it will be a tragedy if he shows up on satellite radio. 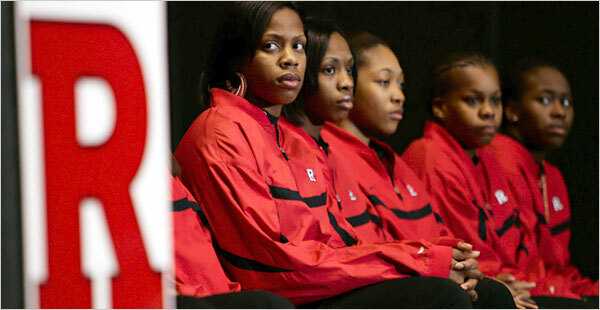 The Rutgers women were magnificent on and off the court. Let it build and grow. At least a CBS Director calls for his firing. By rights Imus will lose his job -- permanently -- and the media as a whole must stop him from being employed in the media for life. It's not enough for CBS to have his head -- competitors must also pledge not to hire him. Imus' Executive Producer, Bernard McGuirk, had an equal role in the fateful conversation and he needs to go. What is most depressing is that the advertisers are not acting on human values. Some have dropped out, but they are "still evaluating the situation" -- which is not a definitive enough reaction. Let's be clear: it is critical that ALL ADVERTISERS PULL OUT. CBS and MSNBC must act more definitively, too. Imus is suspended for racially deprecating remarks. Read Gwen Ifill's response in today's NY Times op-ed page (where she talks about working, succeeding, on an uneven playing field). It is impossible to imagine who Imus thinks he represents with such a comment; and even more difficult to understand that he will return to his job in 2 weeks. The Rutgers women will meet with Imus. Maria Newman reports for The New York Times.